Expected ship date Tue May 07 2019. Select either Stereo 2-way or Mono 3-way operation via the switches located on the 223xs's rear panel. Designed specifically for mono subwoofer applications, the 223s's LF sum switch “sums” the low frequencies of both the left and right inputs. The sum is sent to channel one’s low output marked “LF SUM”, while channel two’s low output is not used, and channel two’s phase invert led is disabled, indicating it is not operational in “LF Sum” mode. The summed low frequencies represent all the low frequencies of both the left and right inputs, and since lows are generally non-directional anyway, it will not detract from the true stereo picture of the source material. If you are using your system in stereo 2-way or 3-way mode, the needed crossover frequency may be higher than 960 Hz, making it necessary to set the x10 switch to the active position. This changes the range of operation of the frequency selector from 45-960 Hz to 450 Hz to 9.6 kHz. All other frequency selectors remain the same. The 223xs features a Low Cut Switch for selecting the 40 Hz high pass filter. An LED indicates the selection. Every output is equipped with a polarity (Ø) reverse switch on the front panel. When speakers are not “in phase”, the frequency response of the system is compromised, particularly in the low frequencies. Out of phase signals can also cause “comb-filtering” in the high frequencies. The polarity switch is extremely useful for fine tuning your sound system for peak performance. An LED is activated when the output polarity is reversed. Level controls are provided for the Low Output, High Output and Mid Output to dial in your system exactly as you want it. The 223xs features Linkwitz-Riley filters with (almost) perfect phase-coherency, and no peaks or dips at the crossover frequency. Easily determine the stereo/mono mode status of the 223xs via the front panel LEDs. The secret to making speakers sound great lies with the crossover you use. With the dbx® 223xs Crossover you'll get great performance, ultra low-noise, rugged reliability and four decades of dbx knowledge and expertise in building the world's finest processors. The 223xs uses precision filters to separate the audio signal and direct the correct frequencies to your loudspeaker drivers. By directing only the specific frequency bands to each speaker driver the 223xs leaves your amplifiers free to use their full power on the usable signal eliminating distortion and giving your PA system a cleaner and better sound. 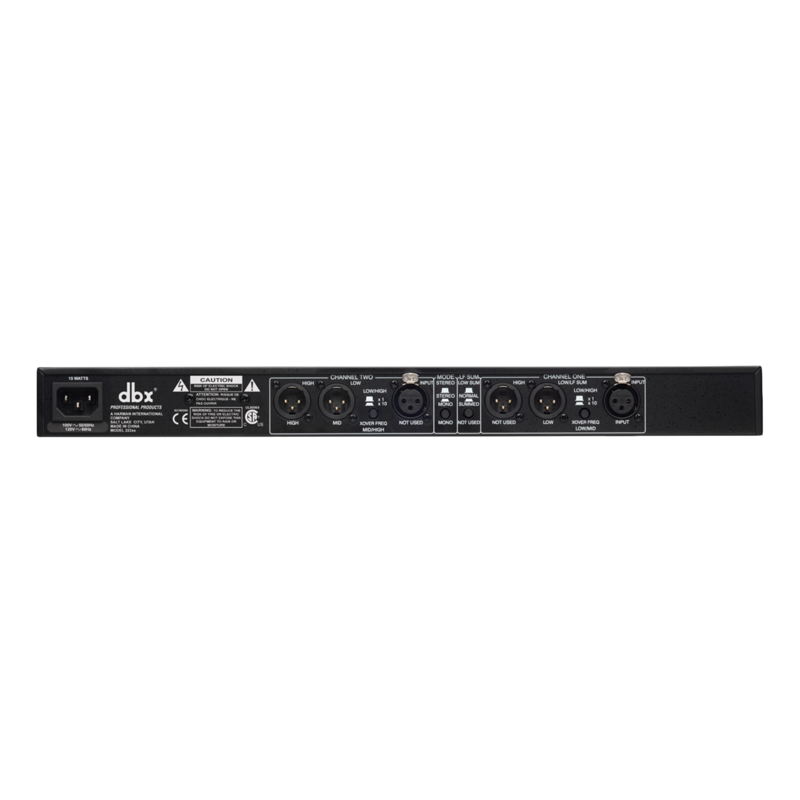 The dbx 223xs is a dual channel crossover with all the features you would expect from a professional product. 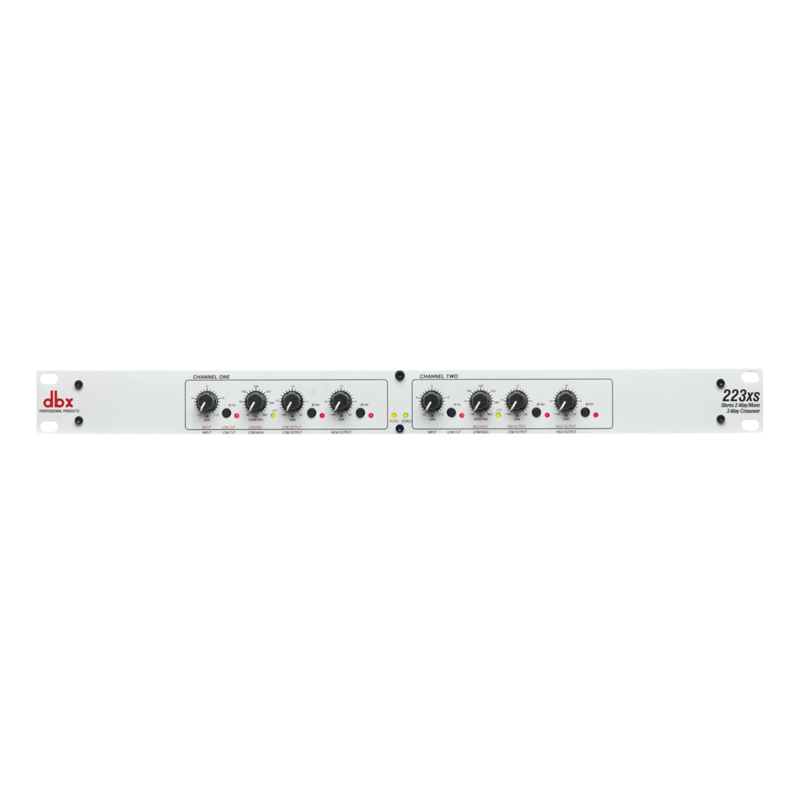 It features Linkwitz-Riley 24dB per octave filters, independent output gain controls for level matching, output phase inversion, 40 Hz low cut filter, and optional mono summing of the low frequency (subwoofer) output. Everything in the design exudes great precision from the solid "click" controls to the high quality 1/4" TRS inputs and outputs.